You will love the convenience of corner shelves in any room of your home and best of all, you can install them in just seconds using no tools or hardware! It’s true! You simply decide where you want your corner shelf, turn the locking button that secures the shelf to the wall, and like magic, it’s installed! It’s really that easy! 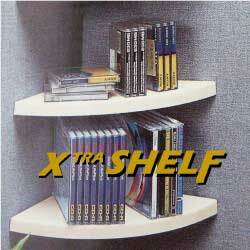 Corner shelves are great for organizing a CD collection, displaying photos, holding plants, freeing up kitchen and bathroom counter space, storing garden, auto, laundry, office and paint supplies, doubling cabinet space, plus so much more! No tools or hardware! No Glue! No Velcro! Holds up to 9 Lbs.